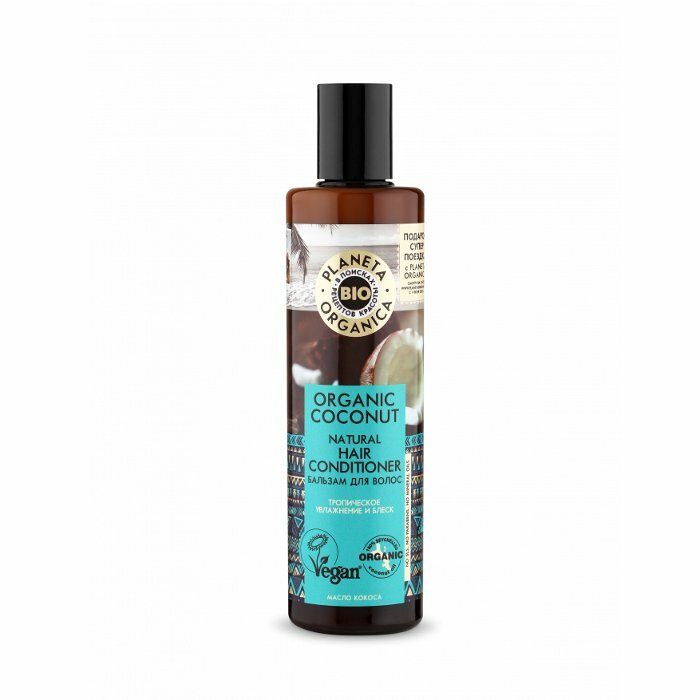 Planeta Organica In Search of Beauty Recipes presents Organic Coconut Natural Hair Conditioner, also labelled as Tropical Hydration and Shine. It is specifically designed to keep your hair hydrated at all times, as well as restore its natural healthy shine. Contains 97.8% of natural ingredients. Free of SLS, parabens and mineral oils. Coconut oil is one of the most widely used cosmetic oils. Due to its high saturated fat content, it has a long shelf life and an ability to lock in moisture, preventing the hair from becoming dry, dull and brittle. Alongside fatty acids, coconut oil contains vitamins E, C, B, as well as a number of micronutrients that help to keep the hair healthy. Coconut oil is suitable for all hair types, but it is especially great for taking care of dry, dull, and damaged hair. Planeta Organica uses the finest quality extra virgin coconut oil imported from Seychelles. It provides intensive hydration from root to tip, helps to repair damaged structure, makes the hair softer, smoother and more manageable. In addition, coconut oil has a positive effect on the scalp. It provides the scalp with nutrients and moisture, prevents dryness and flaking, reduces scalp sensitivity. Coconut oil is also valued for its protective properties. It helps to protect the hair from the harmful effects of UV rays and high temperatures (for example, during blow drying and heat styling). Another natural ingredient contained in the conditioner is bitter orange flower water. It smooths down keratin scales on the hair surface, making the hair sleeker and tamer. 100% plant-based formula free of animal ingredients. Certified vegan. Directions. Apply to clean, damp hair from root to tip. Leave for 1–2 minutes. Rinse thoroughly. Ingredients. Aqua with infusions of Organic Cocos Nucifera (Coconut) Oil, Organic Citrus Aurantium Amara (Bitter Orange) Flower Water, Cetearyl Alcohol, Behentrimonium Chloride, Dicaprylyl Ether, Cetrimonium Chloride, Lauryl Glucoside, Benzyl Alcohol, Sodium Benzoate, Potassium Sorbate, Glycerin, Citric Acid, Parfum. Want to buy Organic Coconut Natural Hair Conditioner? Call us or submit your order via our web site!